This Kiousâ€™ Antique Tortoise Auto, under-layed with gold leaf for dimensional effect, has a double-ground dagger blade that clicks with authority when you press the engraved trap door. 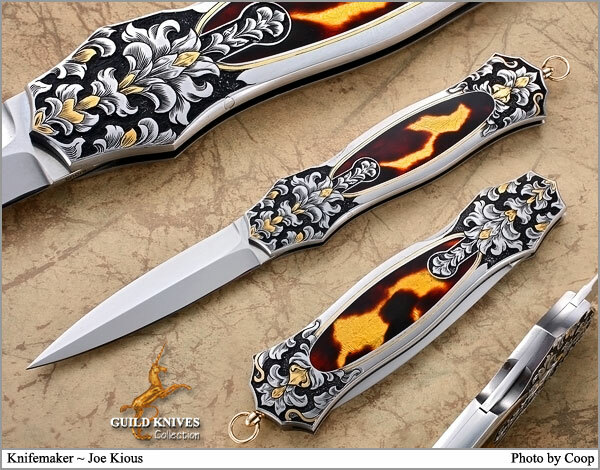 The deep engraving and gold inlays appear to be that of Ron Skaggs, although it is not signed, because Ron is one of the few engravers doing deep relief carving with black matte finished enameled backgrounds. Gold lanyard loop.